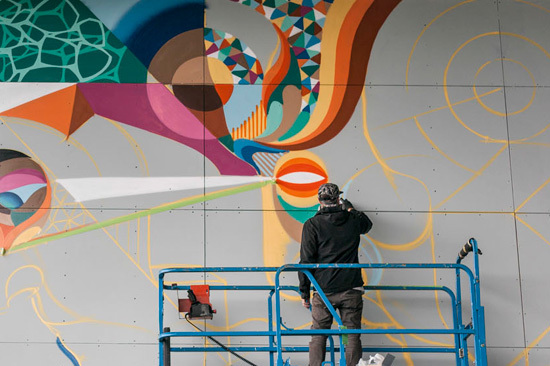 His instantly recognisable — and totally trippy — murals, artworks, and designs have brought him international acclaim. We sat down with Brad Eastman, aka Beastman, to find out what inspires this prolific artist and designer, and get the dirt on his newest project, East Editions. TUL: How did you get started? Have you always been into art and design? BE: Yeah, I was just always into drawing characters and logos as a kid, and then as I grew older I got more and more interested in painting, design and photography, too. I was always super into skateboarding and music, and everything visual that was associated with both of them. It was skateboarding magazines, videos, board graphics and album cover art that were my doorway into the arts, the only art I was really exposed to was either the art I saw through skating or music, or the graffiti I saw while out skating in the streets. TUL: Have you had any formal training or are you self taught? I studied graphic design when I finished high school, but I am essentially a self-taught painter. I spent many years drawing and experimenting with different styles, paints, colours and mediums before I felt I was confident in my ability to actually output what I had envisioned. TUL: Your work is instantly recognisable — who or what are your influences? Like most artists I am, of course, inspired by other artists work, especially those who are on a similar wavelength to me, trying to create unique imagery and unseen worlds. That being said I don't think I am directly influenced by them though; my work is influenced by other things — design, geometry, balance, fantasy, nature — and is driven by my desire to create artwork that cant be compared to anyone or anything else. TUL: What are some your favourite projects? I love collaborating with other artists and friends. Recently I have done some great mural projects with Vans The Omega, Numskull and Phibs — these have been my favourite projects to work on. Also lately have been really enjoying working on East Editions. 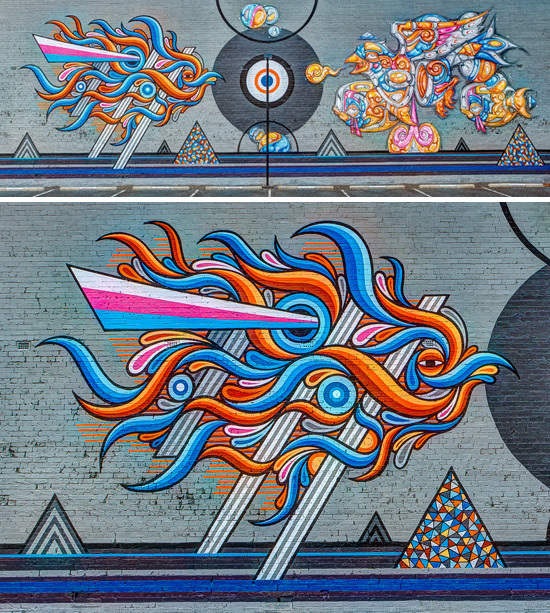 TUL: How does creating a mural differ from a traditional piece of work? For me the two are very different. My body of work is ongoing and constantly growing, so essentially the imagery I am painting at the time remains mostly the same, but the physical size, methods, techniques and timeframes change dramatically. My traditional smaller paintings I create for exhibitions are a lot more time consuming and the compositions are more measured and exactly how I want them to be. When painting mural works you are always forced to be creative with an existing structure or surface, so this has an effect on the actual artwork, especially its format and composition. So my smaller paintings are created exactly how I want to create them, nothing can interfere with the vision. I hope that makes sense. Either way I enjoy all the different ways I output my artwork equally the same. TUL: Where do you prefer to work, in situ' or in a studio? I like to always be changing up what I am doing, so I enjoy one week painting a mural somewhere, but then spending a week in the studio or at my home working on some paintings, or creating some vector work on computer. These days I do prefer to be around home as much as possible though just so I can hang out with my wife and son, watch the little guy growing up so fast. TUL: How long does it take you to create a piece of work? Is there much planning involved? This all depends on the piece of work. With my paintings I tend to plan bodies of work rather than individual paintings. When I have a solo show approaching I tend to plan out the whole show first, and get my head around how I want the paintings to look and also hang together within a space. Then I go forward and physically produce the work. My acrylic and ink paintings will often take me a couple of weeks to complete each one, sometimes longer. But then the large mural works are much faster, just a day or 2, the aerosol paint and the large size allow the images to come out much, much faster. TUL: You're also into photography — what do you like to photograph? I love shooting skateboarding, I got right into this when I was younger and honestly thought I was going to try make a career out of it. Then the art just started to take over. I still enjoy shooting and am always trying to get good shots of beautiful and talented people around me, not for any purpose other than the enjoyment of the actual image capturing process. TUL: Tell us a bit about East Editions — What inspired you to start this new arm of your business? East Editions is a project I started with my wife Kelly, we really wanted to build something together, a family business we could put our creative skills and energy into and then grow old with. The focus of East Editions is to bring together artists and other creative friends to make unique, hand made, limited edition products. So far we have made products with Vans The Omega, Webuyyourkids, Kyle Hughes-Odgers, Luke Taaffe and Roach, and we are currently working on some new things with Numskull, Jae Copp, Phibs and Askew. TUL: You've worked and exhibited all over the world — Where's your favourite city? Of course Sydney is my favourite city. I also love Perth, Hong Kong, Christchurch, Tel Aviv, Istanbul, London, and New York. TUL: What do you love about living in Sydney? I grew up here so I have good friends and family here, it's our home. Its also a tough and expensive city, growing up in Sydney has given me a very strong work ethic and I was always driven to work super hard to make a living doing something I love. Sydney also has some of the best food, coffee, bars and beaches Australia has to offer. TUL: How do you unwind? It's rare for me to be able to unwind, but I guess just doing nothing. I like sitting on the couch watching a good movie with my wife and eating chocolate. I think I can only really unwind when I don't have much on my mind, so I can only really relax when I don't have any big projects on or deadlines looming. If I do, all I think about is how much work I have to do and I shouldn't be sitting around, I should be working on something productive. TUL: What's coming up next for you? My wife and I are about to have our second child, so this is the main thing coming up for us. I have also been working on the soon to be opened Tryp Hotel in Brisbane, its a new boutique hotel filled with artwork by myself, Numskull, Rone and Fintan Magee, its a really interesting, challenging and fun project. Otherwise I just have a few other mural projects coming up, maybe another exhibition late this year or early next year, some new products with East Editions and also a couple of events with The Hours. Trying to keep it quiet for the new baby, so been pushing a lot of work away lately, just freeing up some time. You can find more of Brad Eastman's work here. Want more two minutes with...? Click here!